Watching those on the porch. This coyote knew its way around. This lurker in the evening woods. Capture, meat for a day or two. To listen to it sing to the moon. 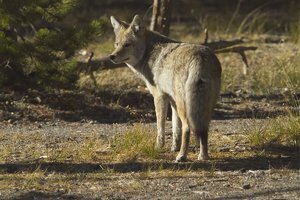 This entry was posted in animal poem, Mary Kendall poetry, meditative poem, memory, Nature, nature poem, poem, Poems, poetry, prey and tagged capture, coyote, fear, lurker, Mary Kendall, moon, nature, poetry, predator, prey. Bookmark the permalink. You really recognized the coyote in this poem and showed a lot of respect for them. I’m sure that if coyotes could read they would thank you. That’s a very kind thing to say, Alex. Having great respect for nature is very important to me…and clearly to you as well. Thanks for leaving such a nice comment. This is a really great picture! The poem is also very well written and very interesting. I love poetry. Seeing a blog all about poetry makes me so happy. I could really imagine your poem because it was so amazing. I really love your poem about the coyote. I love how descriptive it was. You could really see the images in your mind! Very well written, very original, too. Hi. Thanks for visiting my blog and reading through some of the poems. Poems should be original and true to the ‘voice’ of the poet, don’t you think? I’m so pleased you feel I managed that. Your comment is much appreciated, Oliviero. Coyotes are smart animals. The conflict between wild animlas and people over space is a very hard one, isn’t it? There is no easy or simple answer. Thanks for commenting on this. I really respected your view on this creature, it was a really thoughtful way of looking at it. I used to live in a woods, spiders were a real problem in my house, and coyotes were known to slink around. I had once gone out to the backyard where I saw my dog standing still gazing into the eyes of a wolf like figure. I called her inside before it could get much farther, and that night I was still mesmerized but the way the coyote’s eyes had glinted in the shade of the trees. Thanks for sharing your story. It sounds as if you have a real poem hidden in there waiting to be written. Your last two sentences are so lovely. This is a beautiful poem. I never knew somebody could write anything this great about a coyote. Thanks for such a generous comment. I’m glad you liked this poem. I really love this poem about the coyote. I liked the ending, listening to it sing at the moon. I really like your poetry. What a generous comment. Thank you so much. I’m glad you stopped by. How kind of you. I’m delighted that you like it. Hi Lily. Photos are often a good source of inspiration. Very nice! I think your poetry is awesome. Thank you for such a great comment! I open the window late at night To listen to it sing to the moon. Thanks for stopping by and taking the time to comment. I look forward to visiting your blog as well. You honor the coyote in your poem. I appreciate that. It must be tiresome for this poor trickster to always be viewed as less elegant than a wolf and less loved than a dog, and yet, like them, he’s just trying to survive. I once nearly ran into one while out on an early morning run and was amazed at how intelligent he appeared as we looked into each other’s eyes. Thanks for your lovely comment. I’m glad you really understood my perspective so completely. Best wishes.